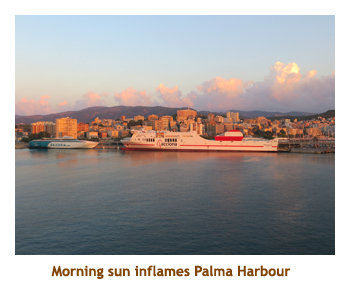 We chose this cruise because it included 5 ports that we had never been to before, especially the Balearic Islands. Also, we do love the Freedom Class ships. We had done the Freedom and the Liberty before, but never the Indy. Also it was a pretty good price. 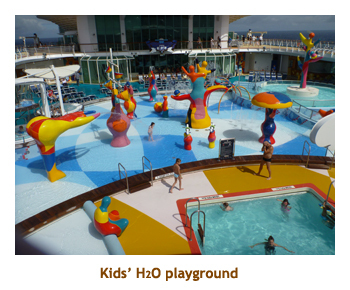 When we first booked the cruise there were only 7 ports. 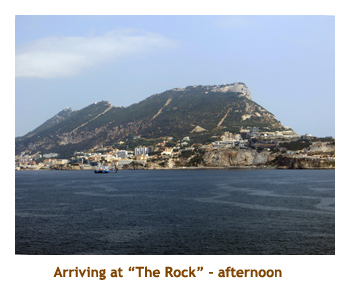 However, a couple of months before the cruise they announced an itinerary change adding Gibralter. Score! Another new-to-us port!! To justify the air expense and the wicked time zone change, Marjorie booked us on a preceding bus tour of Ireland, so this cruise was actually part of a larger holiday trip. Because we were dragging bags around Ireland, we decided not to bring formal clothes. Marjorie had a nice dress and I brought a tie and sweater. That would have to do. We had to bring a selection of wear anyways, as Ireland was cool and rainy while Spain would be hot and sunny. Rewinding a bit (if you're continuing from the Ireland diary), we had a noon flight over from Dublin, arriving in Heathrow about 1:30. After grabbing our bags and going through customs, we did the tunnel thing to the Central Bus terminal. It's a long hike! Marjorie was able to get us on the next departing bus to Southampton (3:00 PM), and return tickets for 8:00 AM. Both legs were fairly optimum too, without a lot of extra stops. At 3:00 we boarded the bus and drove around the airport stopping at terminals 4 and 5, picking up additional passengers. 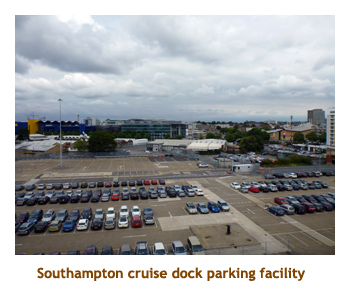 Then we headed southwest for Southampton. We just had one more stop in Winchester. We hit an accident along the way so the going was quite slow. We finally reached the Southampton bus station by 5:30, about a half hour late. Marjorie had booked us at the new quayside Premier Inn. 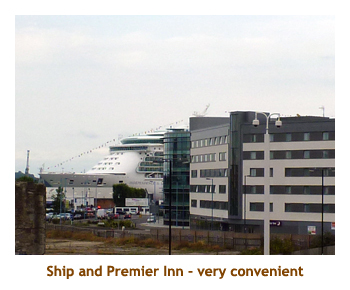 It happened to be just a couple of blocks from the bus station,and in the direction of the cruise terminal. The hotel was very basic, but was adequate and brand new. After checking in and dropping our suitcases in the room, we headed out for a night on the town. It was only a 5 minute walk over to the new WestQuay shopping mall. We did a quick tour through the new mall. 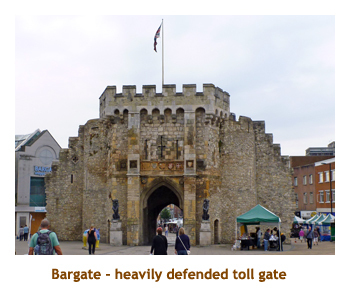 Then we went through the Bargate to the tourist area and found a pub for dinner. Fish & chips, of course. On the way back to the hotel we stopped in at a Tesco for two 6-packs of Coke and some juice for Marjorie. Then it was back to the hotel for an early night. 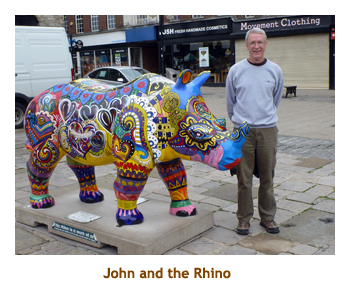 Note: There were a number of huge rhinoceros (97 in all) sprinkled through the city, all brightly coloured. It was the same deal as the Calgary cows we had a few years ago. 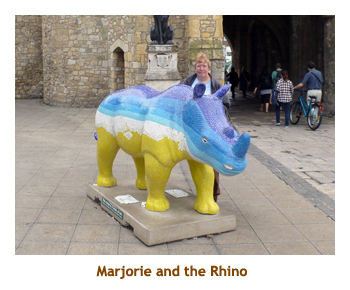 The event was sponsored by the Marwell Zoo. We were up about 7:30 on a cool overcast day. We packed our stuff ready for the cruise and then headed out for breakfast. There was a Marks & Spencers in the nearby mall, so we ate in the cafeteria. It was a good breakfast. My electric razor had packed it in while in Ireland, so we popped into John Lewis where I bought a European (240V) Phillishave for BP 30. I can use it for all our Europe trips now, plus on the cruise ships. No need for an adaptor or converter now. We were back to the hotel by 11:00, checked out, and walked about 2 blocks to the cruise terminal. Wow, the hotel was really conveniently placed! We did the checkin thing at the terminal and then boarded the ship. I was a bit worried about carrying on Coke, as liquor was being confiscated, but I got through security just fine. It could have just as easily been a 12 pack of beer as no one checked. 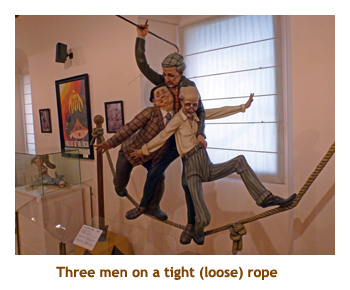 Having just been on the Liberty (sister ship) everything was familiar. We had lunch in the Windjammer (buffet) and headed to our cabin at 1:00. Our bags arrived shortly after so we unpacked (finally, after two weeks!). We wandered the ship for a while and then went to the 4:00 muster drill. At 5:00 we did the Diamond Club free booze party up on deck 14. This would be available to Diamond members each day for the entire cruise. Woohoo. Dinner was at 6 PM where we met our tablemates - a couple from Vancouver with their 15 year old son and his friend. We wandered the ship some more after dinner and then back to the cabin for an evening read and early to bed. Today we slept in until 7:00 AM. It started off cool and overcast, but as we headed south it warmed up and the sun came out. We had a leisurely breakfast, as our first appointment for the day was the Cruise Critic Meet & Greet party at 10:00 on deck 14. It wasn't a very large group at all which was expected as very few people had chatted on the message boards. I don't think we met anyone there that we even saw again during the cruise. No one had arranged any private tours, so we didn't have any excursion mates to meet either. So much for CC! For lunch we did the now famous salad bar lunch in the dining room. This is the best lunch ever, but only available on sea days. At 3:00 we joined the progressive trivia throng and teamed up with a wonderful couple (John & Bev) from Norwich. 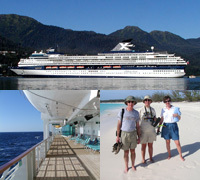 (By this time we had discovered that Marjorie and I were the only two people aboard who weren't British). Being sports minded, we called our team the "Flaming Canaries". The first quiz typified our results for the remainder of the cruise, finishing somewhere in the middle (or so I like to think). Then it was time for the gym. Row, row, row your boat! Tonight was formal night and we dined again with the Vancouverites, reminding us that there were at least 6 Canadians aboard. I think I mentioned earlier that I didn't bring my formal wear. I wore a tie and a sweater. No one was offended at our table as the father and the two boys were all wearing jeans! I had shrimp and crab ravioli. Very Good. 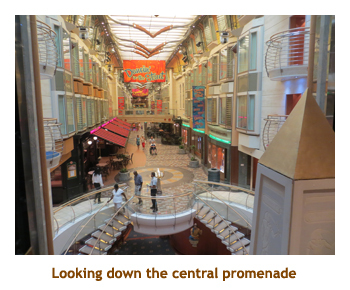 We wandered the upper deck for a while and then retired to our cabin. We woke up at 7:00 AM to a hot and sunny day. (28 degrees). We were in Vigo, which we had never been to before. Spain is an hour ahead of Britain, but Portugal is not. 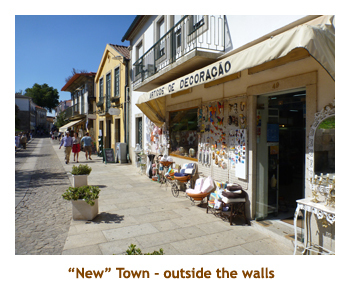 Because we were going to be in Portugal tomorrow (Lisbon) we did not have to turn our clocks ahead for just one day. Hence, our ship's time was not the same as local Vigo time. We did breakfast in the buffet and then grabbed our backpack and headed to the theatre for our 9:30 excursion. 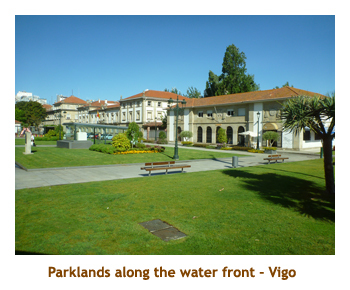 We debarked and boarded a bus for a tour of the city of Vigo (pronounced "Bee-go"). The "Tour de Spain" bike race was occuring at this time and Vigo was hosting it today. We were warned that there might be traffic upheavals because of this, but there were no sign at all of the competitors. They must have left earlier. 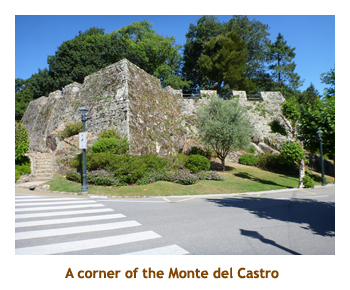 Our first stop was on a nearby hilltop at a fortification called Monte del Castro, built in 1665. We had about 45 minutes to walk around the walls with great views of the city and harbour. 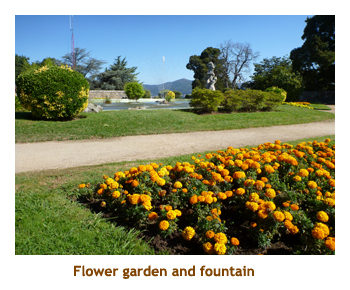 There were some beautiful gardens, fountains and sculptures within the grounds. Then we reboarded the bus and headed south along the coast. 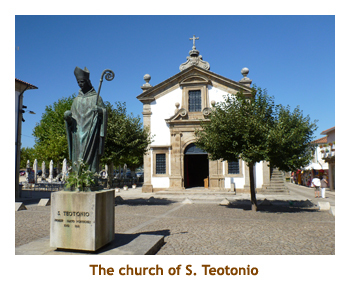 As we drove through the countryside, our guide explained that the small village we were heading to (Valenca) was actually in Portugal. 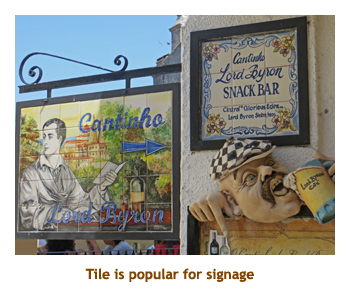 That was great news as the cruise only had one stop in Portugal (Lisbon) and it was nice to see a bit more. 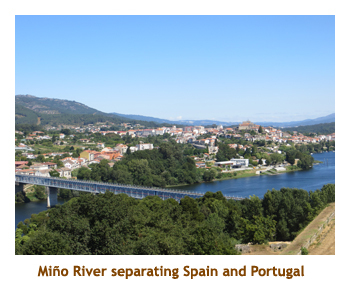 We drove through the town of Tui (Spanish) and then crossed a river that defined the border between Spain and Portugal. The guide pointed out where there used to be a border, but now there was nothing (thanks to the EU). Valenca was on the south end of the bridge. 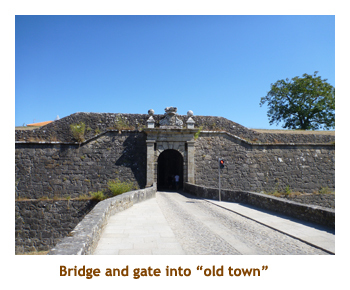 The town turned out to be two small villages stuck together - one outside the city walls and the other one inside. 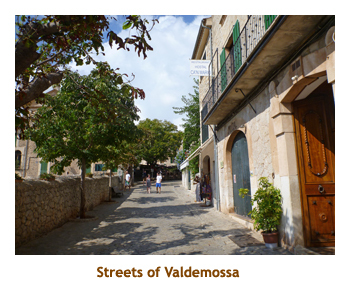 After a walking tour of the village(s) we were given 45 minutes to wander. We stopped at a souvenir shop to buy a table cloth. The clerks didn't speak any English, so it was fun playing charades and trying to describe "rectangular". The cloth we got was excellent quality and fits our two tables perfectly. We drove back the same route and arrived at the ship about 2:00. Marjorie tried the free Wi-Fi on the dock and got a fairly good connection, so we could read email and send out our status. 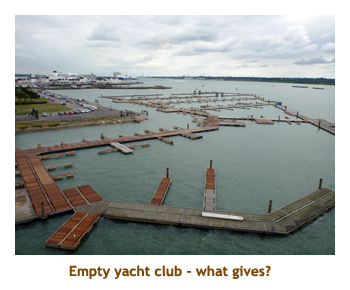 As we boarded the security people confiscated our port, but we were expecting that. 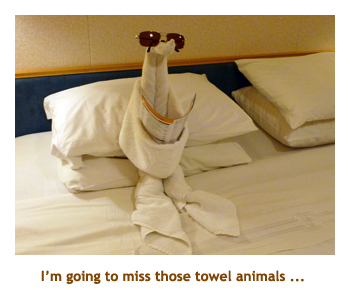 We'll get it back at the end of the cruise. The ship set sail at 3:30. I went to the gym for a 7.5k row. Felt good! For dinner I had the roast beef. We did the evening trivia, but skipped the entertainment. Note: Our son Mike had asked us to get him a bottle of Taylor 20 year port. There was a liquor store in Valenca that had exactly that for Euro 40. We took a chance and bought it knowing that we would pass several liquor stores in Lisbon the next day. 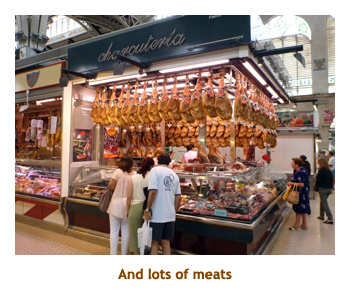 When we did check a few stores in Lisbon, they were all more expensive! How often does that happen? Today was forecast to be sunny and 31. 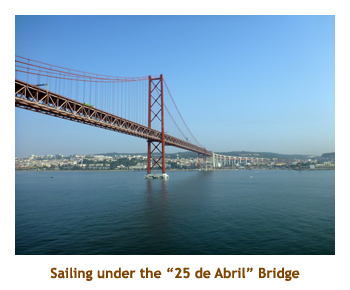 We were up about 7:00 as we sailed up the Tagus River into Lisbon. 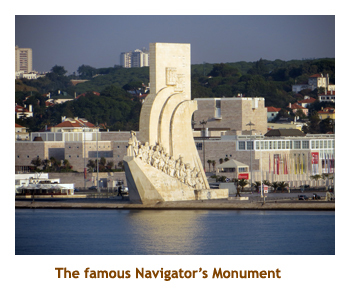 It rekindled memories as we passed the Belem Tower and the Navigator's Monument, as well as sailing under the Salazar Bridge (oops, they hate him so renamed the bridge to "25 de Abril"). On our previous visit to Lisbon we had done a comprehensive tour of Lisbon, so this time we were doing a trip out into the countryside. We had breakfast and then headed to the theatre for our 9:00 tour. 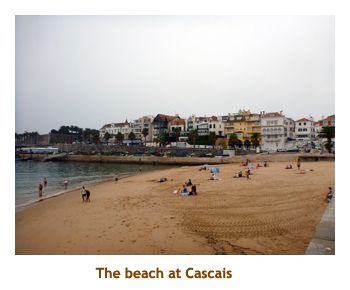 We boarded the bus and then headed north, along the Atlantic Coast to the village of Cascais (pronounced as Kash-Kyshe). It was a bit hazy or foggy close to the water. We were given 45 minutes to wander about the town. 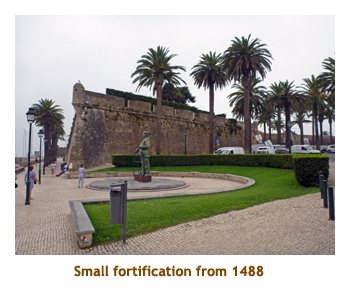 It was interesting as a seaside town, but there didn't seem to be anything historic here other than a small fortress built in 1488. 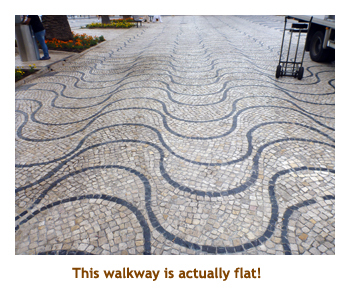 A good portion of the oceanside walkways were tiled in a pattern that made the surface look warped. The visual effect was so strong that I felt I was going to stumble. Wierd!! We stopped at a small grocery store where I bought a bottle of cheap local beer to take aboard. Hopefully it wouldn't get confiscated. Reboarding the bus we continued our tour. 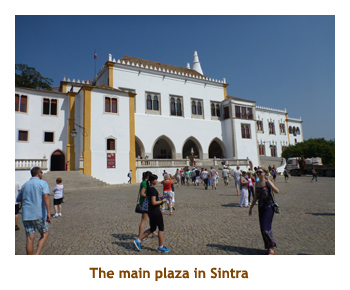 Our next destination was inland and up a mountain to the hilltop village of Sintra. The fog cleared as we climbed the mountain and the blue sky enveloped us. 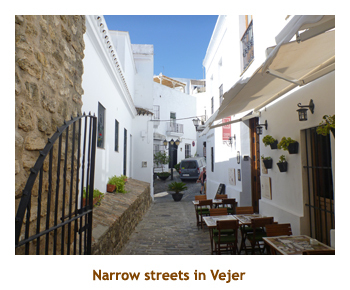 This was a much more interesting village with cobbled streets and old buildings. It was very hilly with most streets seeming to go up. We had a walking tour of the "old town" and then were given 45 minutes on our own. After a bit of a wander, Marjorie and I found a lovely courtyard behind a church that was shady and had a wonderful view. 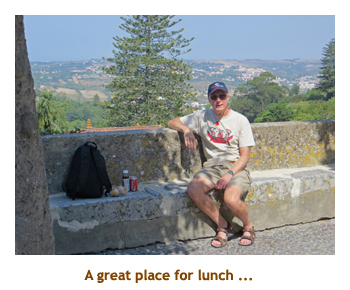 We sat there in the quiet and had our backpack lunch - muffins and a Coke. We had wrapped the Coke in a towel along with a baggie of ice and facecloth. It was still icy cold! Then we reboarded the bus and headed back to the ship. We were on the ship by 2:00 and the security folks ignored my beer. Score! I went to the gym about 3:00 and then we attended trivia at 4:30. Our dinner was at 6:00 each night and we developed a daily routine of going to the Diamond lounge for our free drinks at 5:55 and carrying them down to the dining room to have with our dinner. I usually got a beer and Marjorie a rose wine. Tonight I had scallop linguini. Excellent! The entertainment was a comedian / vocalist impersonator and was wonderfull, very talented. He did a better Neil Diamond than Neil Diamond. Our clocks went forward tonight. 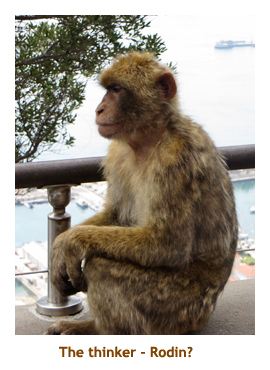 Today was Gibraltar! 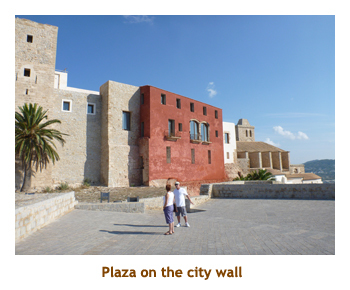 I have always wanted to go there and this was added to our itinerary a month before sailing - just like magic. We were up at 7:30 and had breakfast at 8:00. It looked nice outside with a forecast for 31 degrees. 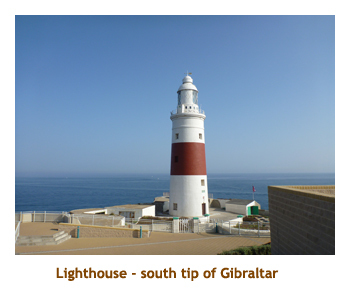 Because of the distance from Lisbon, we wouldn't reach Gibraltar until 3:00 PM, so this was sort of like a sea day. We had our second progressive trivia session at 10:30, and I went to the gym at 11:30. For lunch we did the salad bar in the dining room. 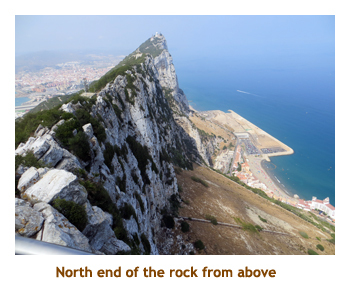 We went up on deck as we traveled through the Straight of Gibraltar and headed for "The Rock". Our tour was at 3:15. Our bus was a small one with about 20 passengers. We started with a tour through part of the city. There were British and Gibraltar flags everywhere, probably related to the recent tensions with Spain. 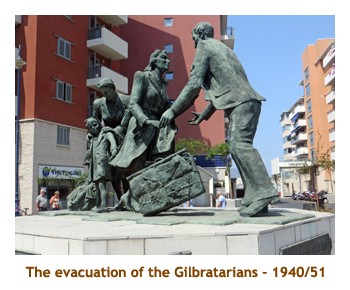 We passed a monument to the great evacuation in WWII which lasted until 1951. We stopped at the base of the rock at a cable car station. Our whole busload jammed into one cable car and we sailed up to the top of the rock. What a view! 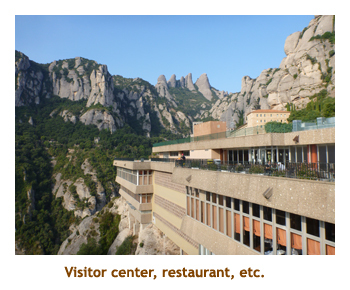 At the top there was a restaurant / souvenir shop, a lookout platform and monkeys. 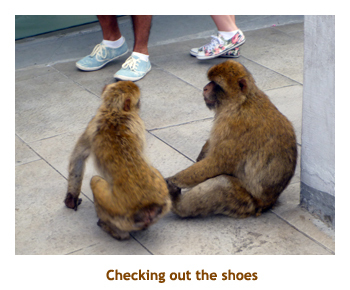 Well, technically they aren't monkeys, but Barbary Apes. Apes have no tail. 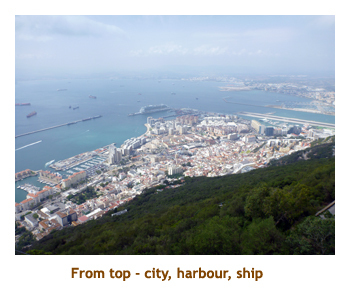 We had about half an hour to check out the 360 degree view of Gibraltar City, the airport and part of Spain. 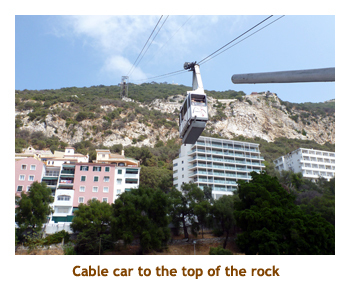 Then we hopped back in the cable car and went half way down the rock. We exited the gondola and walked a short distance to the "apes den". 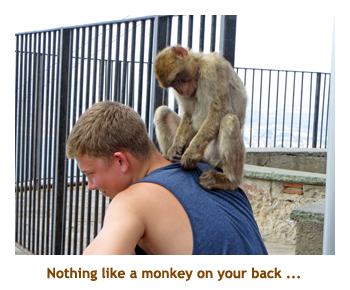 There were a few apes there and I had the honour of having a small one jump onto my backpack (on my back)! Before Marjorie could shoot a photo, the guide ran over and chased the ape away. A teenager with us had the same experience but toughed it out so that we could take pictures. Then we drove a short distance to the entrance to some tunnels. 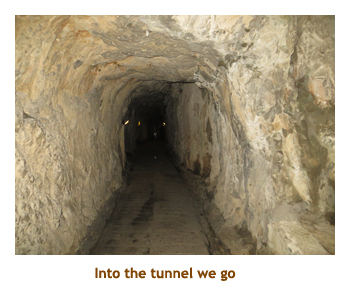 The tunnels were constructed starting in 1782 and were extended in each war since. Most recently, they were used in WWII and during the cold war that followed. The tunnels were deliciously cool and we were given about half an hour to check them out. We actually needed more time to hit every nook and cranny. 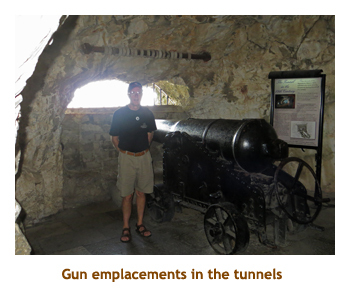 There were lots of cannon and mockups in various caverns that showed how they were used. As our time expired, we headed out back into the heat and reboarded the bus. We drove the rest of the way down the rock and stopped at a museum. It was about 5:30 by this time and the museum closed at 6:00. 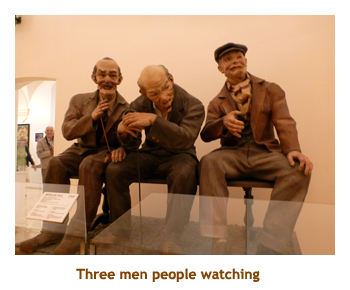 So we rushed through the exhibits which were actually quite interesting. Lot's of naval history! 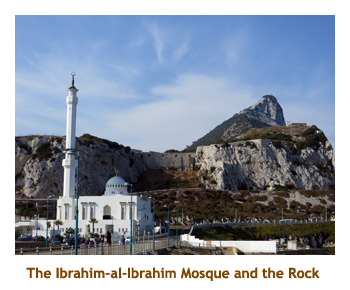 Leaving the museum, we drove along the western coast to the southernmost tip of the peninsula where there was a lighthouse and a large mosque(the Ibrahim-al-Ibrahim Mosque) that was donated by King Fahd of Saudi Arabia. We had a short stop to look around and then drove up the eastern coast, thereby circumnavigating the rock. As we approached the ship we passed the huge lineup of cars waiting to cross the boarder back into Spain. Work to rule! We were back on board by 6:30. We were too late for our fixed seating dining, so went to the anytime dining area and begged to be let in. They let us know they weren't happy about it, but did allow us in. There were lots of empty seats in the dining room because of our 8:00 PM sailing time, so the hassle was really just about prepaid tips. Big deal!! I had atlantic cod. Very good. We were a bit delayed and sailed at 8:45. We skipped the entertainment. After three ports in a row it was nice to have another sea day. We slept in a bit and rose at 7:30. We did the dining room buffet breakfast (deck 4) and sat with some Scots and a couple of Irish ladies. Maybe not everyone on board was from England. 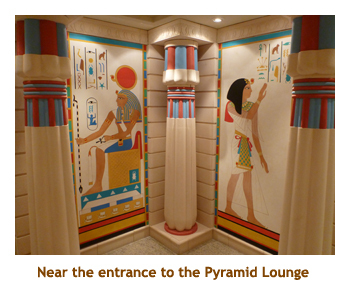 Our first appointment was progressive trivia at 10:30 (in the Pyramid Lounge). Once again we were very average. For lunch we did our favorite salad bar thing in the dining room. After lunch we read our books for a while. At 3:15 we had reservations for the ice show. However, as we were waiting for the show to start, they had problems with the automated lighting so had to cancel the show. We were rescheduled to September 3 (another sea day). So, Marjorie read while I hustled off to the gym. It was dressup night so I donned my tie and sweater again. Our regular dinner mates had warned us that they were going to the specialty restaurant tonight, so we would be alone. So, as we carried our drinks from a raid on the Diamond Lounge, we pleaded with the maitre'd to put us at another table for the evening. Once again they weren't happy, but did take us to a table for 8 that had just 6 diners. The table was almost next to our regular table (but a different waiter). It turned out that the two vacant seats were assigned to real passengers, but they had never shown up. It was a lively table of oldsters and we had a great time with them. I had shrimp on rice. The entertainment was a comedian who was very good. He talked a mile a minute and was very funny. 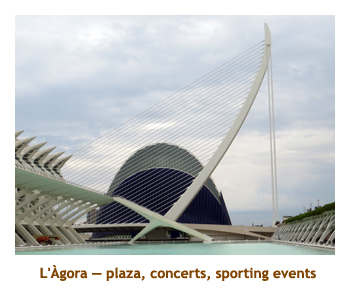 Today was Valencia - the home of Santiago Calatrava (who designed our controversial Peace Bridge in Calgary). 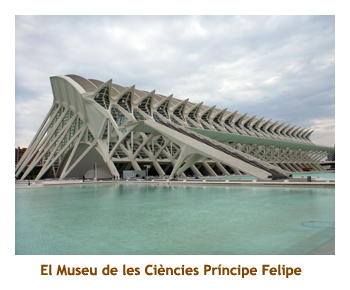 He has created a number of architectural wonders in The City of Arts and Sciences in Valencia. Since seeing photos of his buildings, I have wanted to see them up close. We were up at 7:00 to watch the sail in . Unfortunately the day was overcast, so pictures were going to be poor. We had breakfast and then headed to the theatre for our 8:15 tour. We boarded the bus and started a driving tour of the city. Before long we were at The City of Arts and Sciences and we were given about half an hour to walk around the magnificant buildings. The bulk of the area was a knee deep pool of water and the buildings rise out of the water. 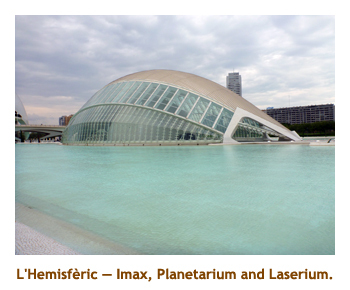 It is certainly a multi-use area with an Imax theatre, planetarium, laserium, concert hall, sports complex, museum of science, oceanographic aquarium, opera house, gardens and more! 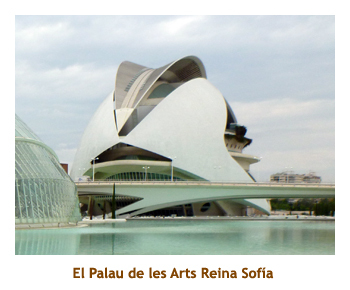 Then, it was back in the bus as we drove to the old part of the city to visit the Fallas Museum. We debarked and had a short walk to the museum. 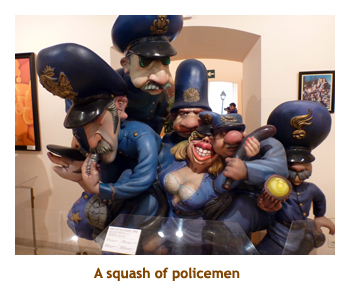 Background: Every year there is a Fallas Festival where people create lifesize images (ninots) of people doing various activities. At the end of the festival, the images are burned. 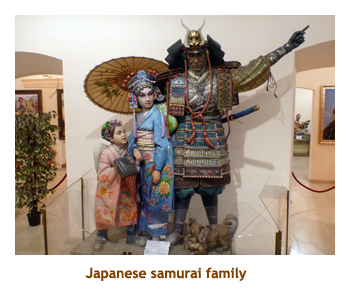 The ninots (gigantic cardboard, wood and plaster figures) that are spared from burning every year by popular vote are on display in this museum. Its collection is made up of all the figures that have been spared since 1934. 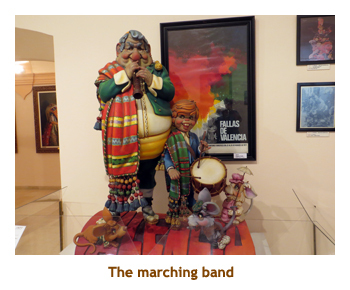 Also on display are posters of the Fallas Festival and photographs of related subjects. We were given about half an hour to wander through the museum and photograph the ninots. I did not get the titles of the various displays, so I have posted a few of the photos with my own descriptions. 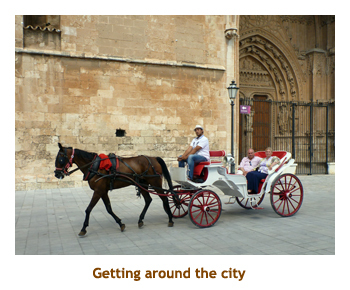 After we finished up at the Fallas Museum, we reboarded the bus and drove to the old part of the city. There we headed off on a walking tour of the old town. It was still overcast so the lighting wasn't the best. 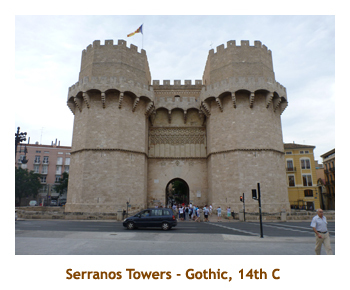 Our route took us by a town hall, some Moorish buildings, the Valencia Cathedral and the Serranos Gates, and a produce market. 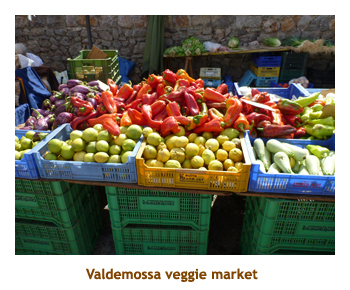 The market was in a huge building with many rows of vendors' stalls. 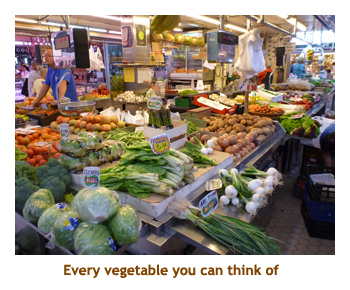 There were veggies, meats, fruits and even some handicrafts. It was an amazing market. 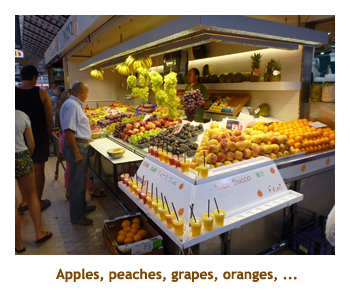 We also learnt the difference between a Valencia orange (sour) and a Seville orange (sweet). The Valencia oranges are used mainly for marmalades and jams. We were back to the ship by 1:00 PM. We had lunch and then went back out onto the dock looking for free wireless. No luck! We read for a while then I went up to the gym to try to move the ship. Our regular dinner mates were back for dinner. I had braised spareribs which were a bit overcooked. We skipped the entertainment. 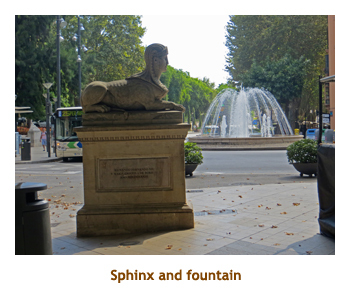 We have been to Barcelona several times, and have done a 3 day stay in a hotel, so yes, it was like coming home. 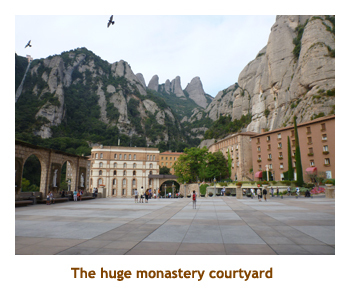 Having done most of the local city stuff, we decided that we would head out of town to the Monserrat Monastery. We had breakfast at 7:00, then headed off to our 8::00 AM tour. It was sunny and warm today - no overcast like yesterday. On the bus, we first did a quick tour of the city. 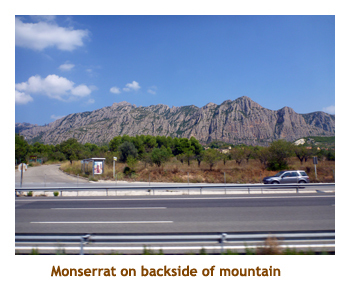 Then we turned northwest and drove through the countryside, about 1 hour to Monserrat. Along the way were orchards of olive trees and in one of them I spotted an ostrich. As we approached the Monastery we drove up a craggy mountain to 4,055 ft elevation, to the site of the Monastery buildings. 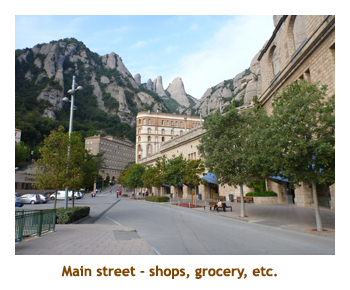 It was a huge site with a small town, tourism buildings and even a small grocery store. In the background was the huge Monastery. There were buildings way down below us that could be reached by a funicular, and buildings way above us reached by another funicular. 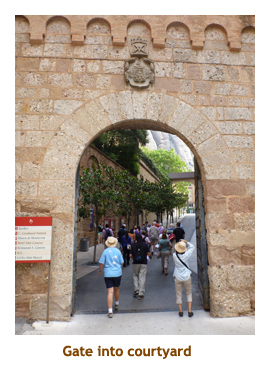 We had a narrated walk from the parking area, along the main street and into the Monastery courtyard. The courtyard was huge and led up to the cathedral. 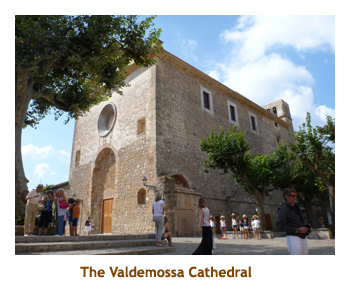 We went inside the cathedral and queued up to go upstairs to see the Black Madonna. 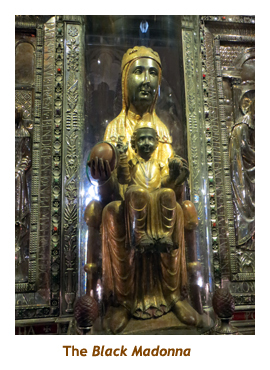 I thought that this was a unique icon, but looking on the Web there are 450 to 500 Black Madonnas in Europe (paintings or sculptures). 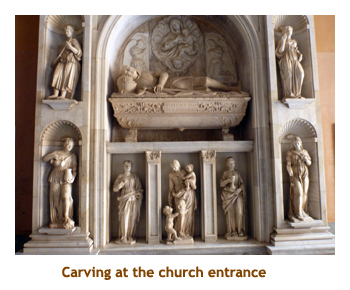 This one is from the 12th century and is housed in a balcony over the alter of the cathedral. Going upstairs one passes in front of the madonna, within about 3 feet. 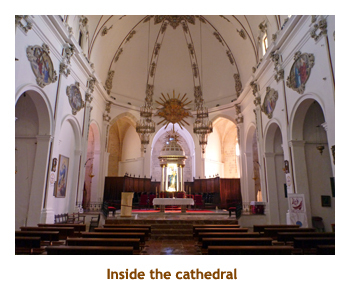 Turning around 180 degrees provides a second story view of the cathedral from the balcony. Going down another set of stairs took us to a side entrance that let us out into another courtyard. From there we walked back to the souvenir shops and the more secular side of the complex. We were given an hour to walk around the area on our own. 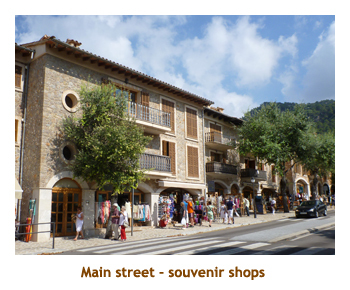 We browsed through the souvenir shops and the grocery store, but didn't buy anything. Then we discovered a cobbled hiking trail the lead off to another small church about half a mile away. 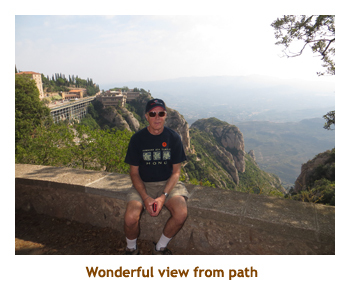 The trail had a slope to it so that we soon had an excellent view of the monastery from above. 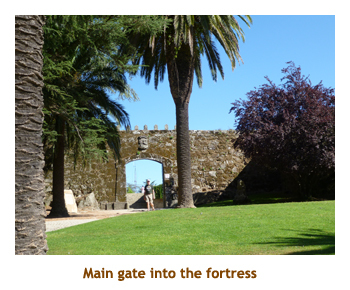 Along the trail were monuments and sculptures, one of which was for the famous cellist Pablo Casels. I didn't realize that he was from this area. We didn't make it all the way to the church but stopped at a small park to eat our lunch (muffins and Coke). There was a beautiful view of the valley from there. 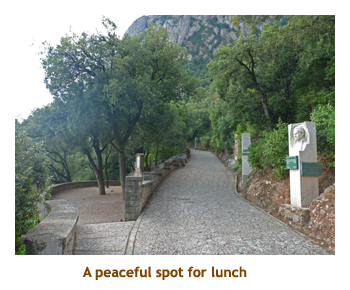 The serenity of the spot was really nice. On the way back down the path we stopped at the two funicular terminals to check out times and prices. We didn't have time to do either trip as we had to be back to the bus soon. We walked back along the main street to the bus stop and reboarded the bus. We took a different road back down the mountain and part way down saw a Nunery in the distance. 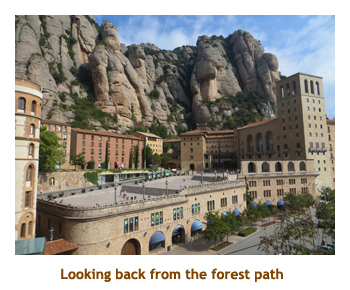 Finally we were to the bottom of the mountain and headed back to Barcelona. Again, it was about an hour's drive. 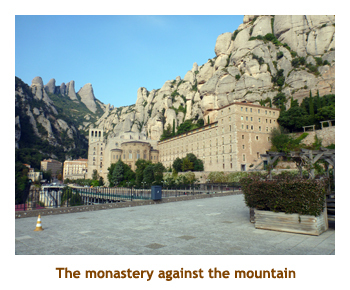 It had been a marvelous tour and we really enjoyed the monastery and surrounds. As we drove back I kept my eyes open for the ostrich, and spotted a group of them. I mentioned it to our guide and she said that ostrich farms were popular here. So, I wasn't going crazy! We were back on the ship by 2:00 PM. I headed up to the gym to wear off my muffin and Coke, then returned to our balcony to read for a while. For dinner I had shrimp and sea bass. We skipped the entertainment (again!). 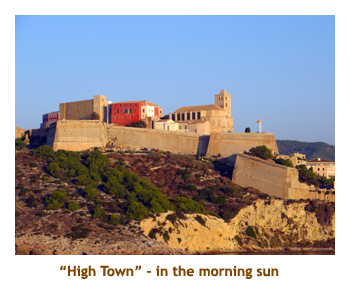 Overnight we had left the Spanish mainland and travelled to the Balearic Islands. 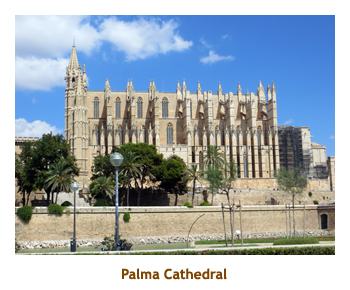 This morning we arrived in Palma de Mallorca. It was our first time in the islands. It was a hot and sunny day again. We were up at 7:00 and had our breakfast in the Windjammer. Then we were off to the theatre for our 8:15 tour. 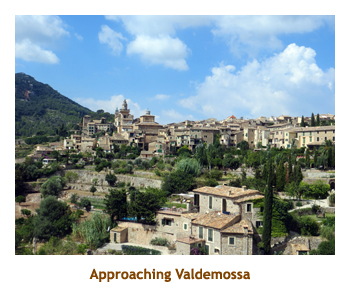 Once on the bus, we did a quick tour through the city and then headed off to the village of Valdemossa. This village was made famous when Fredryk Chopin spent a few months there in 1838, hoping to recover from tuberculosis. He was shacked up with George Sands (actually Amantine Lucile Aurore Dupin). 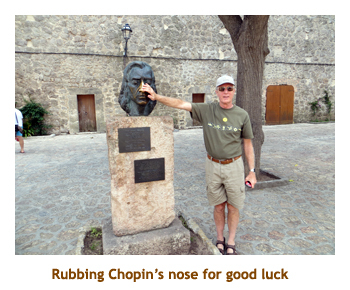 We did a walking tour of the town, including the monastery where Chopin and Sands lived. 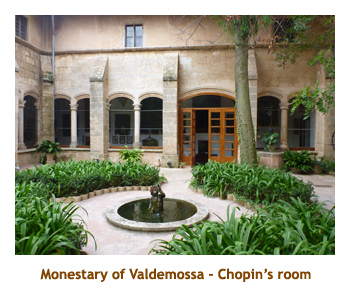 The original room has been furnished with period furniture and Chopin's piano. 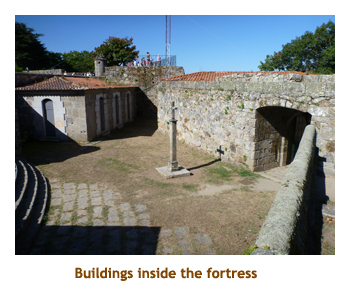 We were given an hour to walk around on our own and enjoyed the cobbled streets and interesting buildings. We got back to the bus stop early and had our usual snack - muffins and Coke. Then it was on to the bus and driving back to Palma. We were back to the ship by 1:00 PM. We had lunch in the buffet and then took the shuttle bus back into the city. 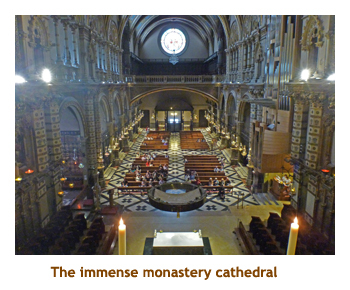 We spent close to an hour walking around the magnificant cathedral. Unfortunately we couldn't go inside as it was Sunday and they had services every hour. 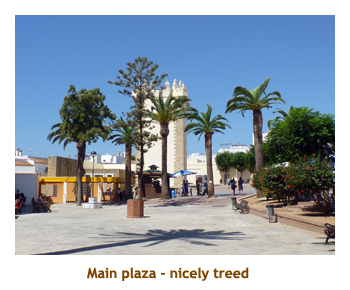 Then we walked along the main avenue to McDonalds to try their free Wi-Fi. 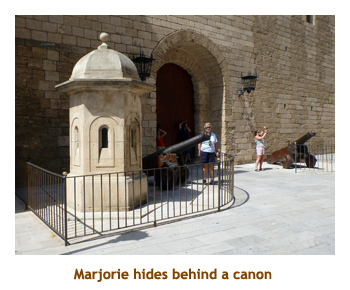 It worked fine so Marjorie did her business stuff. Then we walked back to the shuttle bus and were back on the ship by 4:00 PM. I went to the gym for a quick row. Our dinner mates had warned us that they were going to the specialty restaurant, so we went directly to our "second family" table. We had a great time with them. I chose the roast beef and it was very good. We skipped the entertainment. 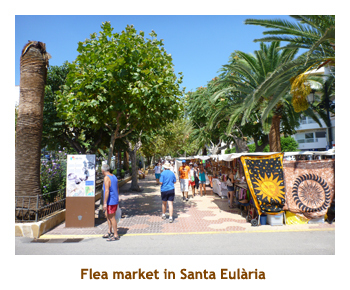 This was our second day in the Balearic islands as we headed to Ibiza. Once again this was a new port to us. And the warmth and sunshine was continuing. Our tour was at 9:30, so we had lots of time to watch us arrive and have breakfast. 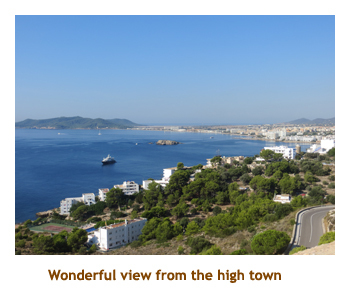 Upon boarding the bus we did a tour through the main part of Eivissa (the main city if Ibiza) and headed up a hill to "high town". 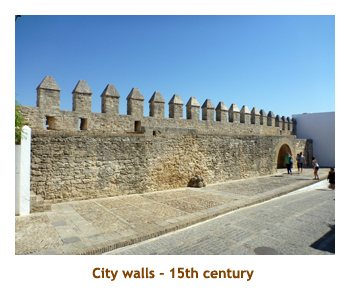 This was the original walled city from medieval times. 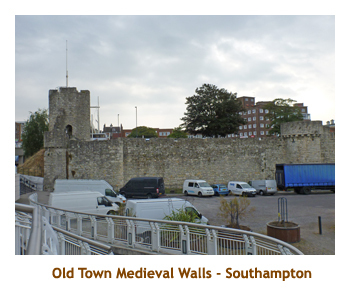 We parked just outside the walls and were led on a walking tour inside the walls. Our tour finished at the cathedral where we were allowed in for some photos. 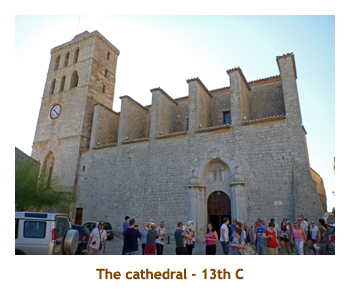 The cathedral was built in the 13th century. We were given some time to walk around on our own. Being on the top of a hill meant that the streets went up and down, nothing on the level! It really was a beautiful little town. Then it was back to the bus again. 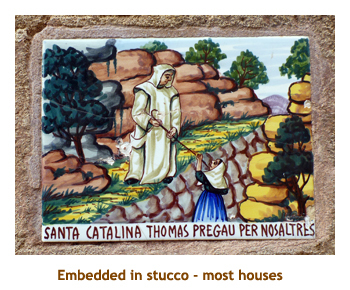 Now we headed off north across the island to the village of Sant Miquel where we would visit the Cave of Can Marca. We parked at a restaurant / souvenir shop and picked up our local guide. 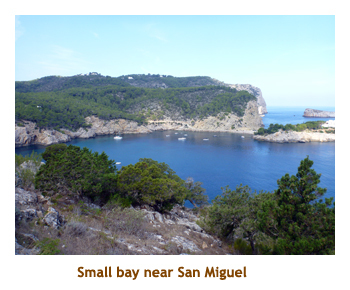 We were quite high up and had a beautiful view over a small bay. 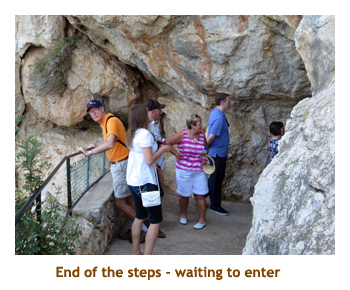 We walked down some 300 steps to the entrance of the cave system. The cave consisted of several small caverns with a highlight water show (with coloured lights) at the end. 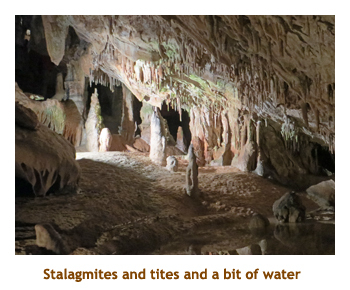 It was very interesting, but nothing like the giant caves we had seen in Postojnska, Slovenia. Then we had to climb the 300 steps back up again! 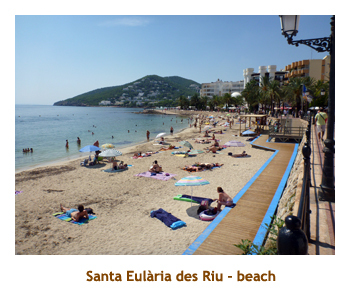 Boarding the bus, we drove east across the island to the seaside village of Santa Eularia des Riu. We were given about an hour to wander around the village and along the beach. Marjorie and I did the beach walk and then took refuge on a shady bench by the flea market, where we performed the ritual of the muffins and Coke (backpackers' communion). We were back to the ship about 2:15. It was a great tour - very enjoyable! It was sunny and warm so we read our books out on the balcony. I did the gym thing around 4:00. For dinner we joined our alternate table and I had shrimp tagliatelli. We did the evening trivia but skipped the entertainment. After 4 ports in a row, it was time for another sea day. Weather? Hot and sunny! We were up at 7:30 and had a long breakfast (until almost 10:00). We were sitting with some very interesting people. Our progressive trivia attempt at 10:30 proved once again that we were very average people. Just as we finished the final question and before marking the papers, an announcement came to clear the Pyramid Lounge (where we were) for a medical evacuation. (The helipad was right above us.) So we grabbed our answer sheet for future marking and hustled up to the pool deck to see the helicopter come. This would be our fifth medivac over our many past cruises. 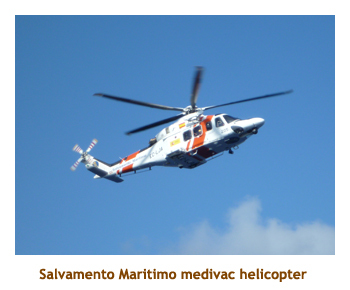 The helicopter was from the Salvamento Maritimo (Spanish Maritime Safety Agency) and would be taking the patient to a hospital in Alicante. 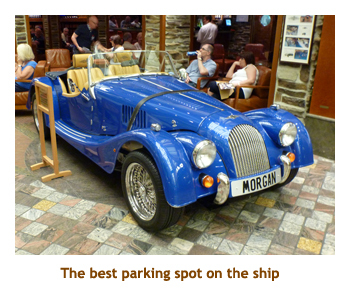 The deck was packed with people and the bulk of the activity was out of sight at the front of the ship. However, they played a bridge camera view on the giant screen over the pool. I think the patient had a broken leg. We skipped lunch and went instead to our 1:00 PM ice show that had been postponed from several days ago. It was excellent. 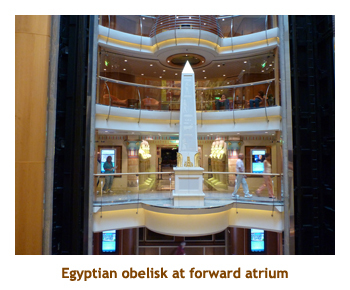 Then we attended a future cruises talk (Marjorie likes those) at 3:00 and "Where in the world am I?" trivia at 4:00. Once again we joined our alternate dining table (regular mates AWOL again). I had rack of lamb - the first time lamb was on the menu - and served with real mint sauce. Some waiters sang for us as we ate so we skipped the later entertainment. Evening trivia was at 7:45. 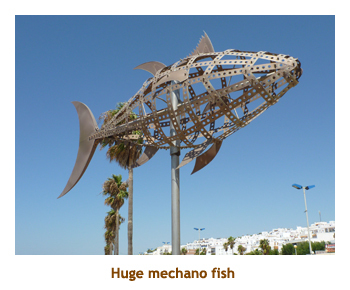 This would be our second time in Cadiz. 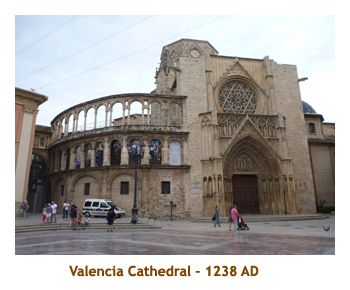 The previous time here we did a full day excursion into Seville. 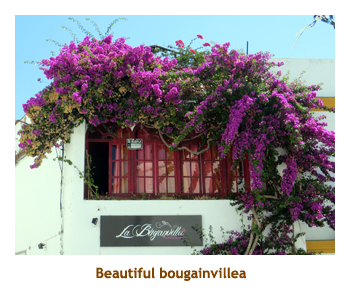 This time we opted for a shorter tour to two "white villages" out in the country. 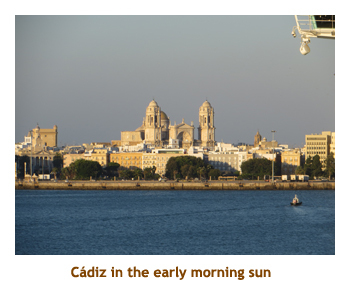 We woke up at 7:00 and watched our arrival at Cadiz. Once again it was a sunny warm day. We had breakfast and then packed for our 9:15 tour. 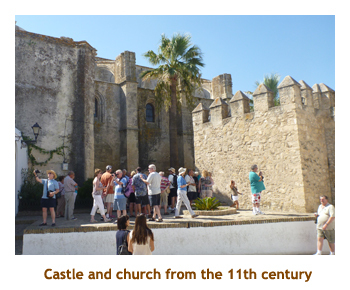 We started with a tour through Cadiz city and then headed southeast along the coast. 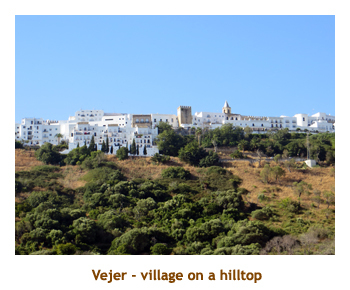 After about an hour we arrived at the hill upon which the village of Vejer de la Frontera is perched. We stopped at a restaurant at the base of the hill for a pit stop and then ascended the 222 meters (700 ft) to the village. 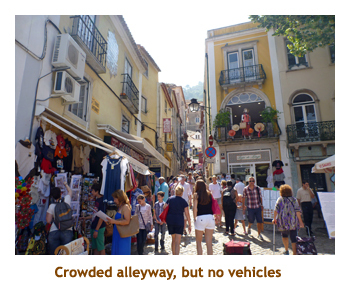 We parked and then did a walking tour of the village. Once again the streets were all on hills so lots of up and down. 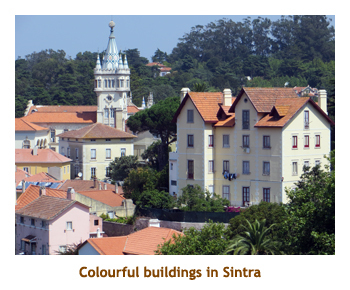 Pretty well all of the buildings were painted white - hence the term "white village". We were given a half hour to walk around on our own. Then we marched back down to the bus for our next adventure. We drove back down the hill and then over to the ocean. Then we headed northwest along the coast. We passed the famous point where the Battle of Trafalgar was fought (Lord Nelson). 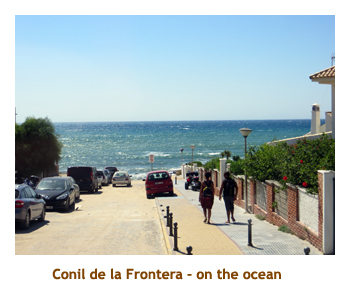 A bit further we arrived at the "white" village of Conil de la Frontera. 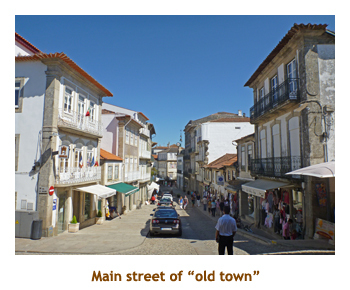 This town was right on the ocean and didn't seem to have any historic buildings. We weren't given a tour at all, just a half hour to walk around on our own. Marjorie was looking for a shop selling t-shirts but there were none! 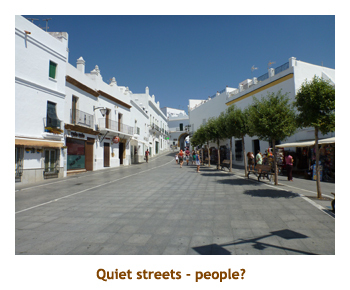 No one wears t-shirts in Spain? We drove back to Cadiz and were on the ship by 2:30. I went to the gym for a workout. 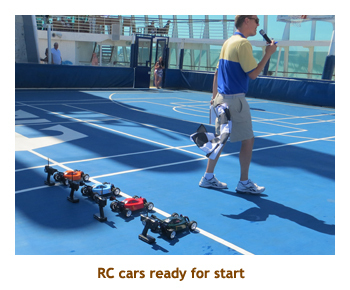 Afterwards I went up to the sports deck to watch the radio controlled car races. This must be new to RCL. Tonight was formal night so I broke out the tie and sweater again. For dinner I had shrimp and lobster. They did the trooping of the cooks right around dessert time. We played 7:45 trivia and then checked out the entertainment. It was a weird string quartet (jumping all around), so we didn't stay. Clocks back one hour tonight. Note of interest: At tonight's trivia, Marjorie and I played as a team of two while our 6 alternate dinner mates were on the other side of the lounge as another team. We saw them, but they were unaware of us. When the scores were tallied up, there was a tie for first place - us and them. At that point they saw us and started to boo us. We thumbed our noses back at them. (All in fun, of course!) The girl running the trivia said "I sense that there is some history between these teams". M and I won the tie breaker question (about London) and so we had to rub it in to our Brit friends. Day 14: Our trip was now down to two final days at sea. We were heading north, so each day was a little bit cooler and cloudier, getting us ready for Southampton. The first day we were up at 7:30. Progressive trivia was at 10:30. We started by marking the sheets from two days ago (medivac interuption!). It was amazing how the scores were elevated from the norm! However, after the next quiz we were all back to normal again. We did the salad bar lunch in the dining room. Our second ice show was at 3:15. On this cruise there were two completely different ice shows, and both were very good. For dinner I had mixed grill (lamb, beef and chicken) as we sat with our regular mates. Evening trivia was at 7:45 and we skipped the entertainment. 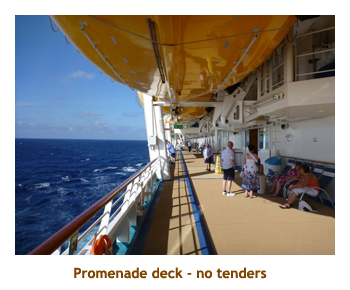 Note: We were wandering around the promenade deck today and I was looking for the double hulled lifeboats for tendering, but I couldn't find any. I stopped one of the officers and asked why. He said that the ship never tenders as all ports have docks. In the Caribbean where this isn't the case, local tenders are used (we did that on the Freedom). 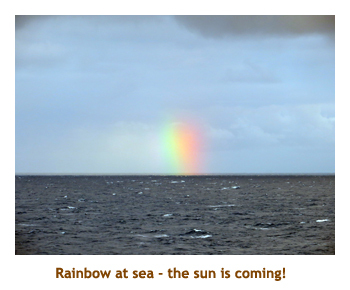 Day 15: Our final day at sea! Very cool outside. We had a very early morning, rising at 6:30. Final progressive trivia was at 10:30 and lunch was the salad bar in the dining room. We're creatures of habit! We played airline trivia at 3:00 and Marjorie was really good at id'ing the aircraft. I think we got 18 out of 20. Then it was time to pack our suitcases. When we returned to our room, the steward had returned our bottle of port, safe and sound. We wrapped it well and put it into one of the suitcases. For dinner our regular mates weren't at the table. 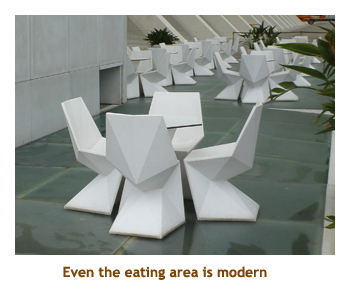 They were always there before us, so we assumed that they were dining elsewhere and joined our alternate table. About 5 minutes later they showed up. Oops! Oh well, everyone seemed happy. The waiter parade was tonight. We skipped the entertainment and went to bed early. We woke up this morning already docked at Southampton. That meant the end of a wonderful adventure - Ireland and Spain. We were up at 6:00 and had an early breakfast. We grabbed our suitcases and were off the ship by 7:00. We grabbed a taxi and drove the short distance to the bus depot. We were there early and had a bit of a wait for our 8:00 bus. The bus was ontime and we arrived at our Heathrow terminal at 10:00 AM. We checked in and had an hour or so wait in the general seating area until our gate was assigned. Then we went through security and waited a bit at the gate. Our 1:30 flight was ontime and direct to Calgary. We arrived in YYC at 4:30 and Matt was there to pick us up, all dressed up fancy and looking good (during an intermission in a wedding ceremony). 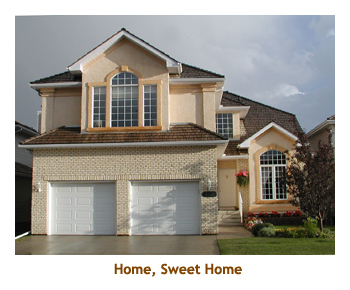 We were home after 5:00. Everything was fine and the kitties were happy to see us. Another wonderful holiday!